Short Edition is a French publishing house created in 2011 for publishing short literature, providing a platform for a quick read on the go. The categories adapted to one, three and five-minute reads are spread over poetry, short stories, and flash fiction. The online platform also holds a section for classics which hosts selected poems for a run down. The platform was created in order to create literary awareness, bring new writers to the limelight and give importance to the timelessness of literature. Moving forward with these objectives, Short Edition is offering a different literary experience to commuters en route work or in transit, with their story vending machine. 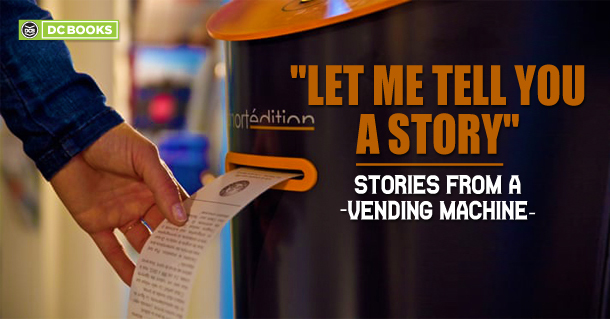 These story vending machines are being featured in France, HongKong and the US in its first phase. Offering genres from romance to sci-fi and children’s fiction free of cost, it features the stories by authors like Virginia Woolf, Lewis Carol, and Charles Dickens to name a few. The story dispenser has been launched with a specially commissioned one-minute tale by the novelist Anthony Horowitz. These story dispensers deliver the message for a refreshing start for an escape from the rabbit hole of social media.